Every year since 2009 a strange purple cow has popped up – or rather tipped upside down on the South Bank, marking the start of Udderbelly, one of London’s most popular festivals. Neighbouring the Udderbelly site and running almost concurrently is London Wonderground, a spectacular of cabaret, circus and sideshows all hosted inside its own beautiful 1920s Paradiso Spiegeltent. Attracting hoards of beer swigging Londoners in the spring-summer sunshine, families could be mistaken for thinking it might all be a bit ‘grown up’ for them, but fear not! Yes, there is plenty within the programme for those lucky enough to steal a rare night out, but during the day, across two festivals and five months there is more than Lola’s Hot Dogs for arts-loving families to be sinking their teeth into. So many stand-up comedians rely on swearing and vulgarity these days to pull in the laughs, so wouldn’t it be refreshing to see top-draw comedians perform the best of their wears, without the rude bits? As well as that the crowd are promised ‘never the same gig twice’. Sounds better than grown up comedy any day. Occupying a space in the line-up of both festivals, the world-record breaking beatboxer returns to make music with nothing but his mouth and a mic. Hot on the heels of this year’s eagerly awaited remake of Walt Disney’s 1967 cartoon, this unique theatrical production brings the story of Mowgli into the 21st century, setting it in an urban jungle and packing it with street dance and circus. Embracing the impromptu nature of working with kids, little people are given a free rein to set the storytelling agenda with this improvised musical show for kids. When it all gets too exhausting it’s great to know that you can just tuck yourself up in this bedroom installation and let the chaos outside wash over you, through magical light projections, theatre and dance. Udderbelly runs until 17th July. London Wonderground runs from 5th May to 25th September. Southbank Centre, Belvedere Road Coach Park, London SE1 8XX. Would families give Edinburgh Fringe a rave review? I’ve just returned from the opening weekend of the Edinburgh Fringe, but contrary to my Arts Aloud mission, I actually decided this year to go child-free. Aside from it being a fantastic opportunity for myself and my husband to spend some well-earned time alone, we did also have it in mind that it might be worth scoping it out for a possible return next year with the kids in tow. As the largest arts festival in the world, the Edinburgh Fringe promises an ‘open-access festival’, a festival that contains something for absolutely everyone, fuelled by the creativity of the many individuals who have poured their passion into their work, and brought it to the city to share with the millions of people who attend each year. As we leapt from venue to venue, mixing up superb theatre with live music, unusual dance and movement with close-to-the-bone comedy, we realised that above all else, it certainly wouldn’t be possible to embrace the fringe with the same intensity that we had been doing. With two children under 5, it’s unlikely that we would want to fill the day with more than one or two ‘appointments to see’, but volume aside, I wondered, could we still ‘experience’ the Fringe in the same way, if the children had come along with us? This year’s Fringe boasts well over 100 shows that are specifically for children, whether re-telling of family favourites or original work. In addition, the rest of the schedule is well sign-posted with icons comparable to film classifications, designed to indicate audience suitability, and providing parents with enough information for them to decide whether to expose their children to some of the more grown-up aspects of the Fringe. Although we thought that this was a great idea, we did have some reservations about how you can enforce the recommended ratings, particularly with regard to some of the more improvised aspects of comedy and theatre. It is also worth considering the very real lack of access to some of the venues involved; particularly in the Old Town with its narrow passageways and steep winding staircases, typical of the buildings that populate Edinburgh’s historic centre. In spite of this, I was given several reminders that one of the most attractive things about the Fringe for families, is that it exists far beyond the pages of the directory listings and the seated shows. It’s live on the streets of Edinburgh, in every corner of the city that you visit, providing hundreds of alternative activities that bring the festival to life and create some welcome opportunities to take a break from the schedule and to kick-back and relax. Courtesy of a range of brand sponsors, St. Andrew’s Square Gardens, is one of many of the city squares that have been transformed into a relaxed social space; awash with deck chairs and food stalls, live (but unimposing) music and even table football and ping-pong. For those who prefer to keep moving, the West End Fair was a really interesting space for a stroll, featuring hundreds of makers, artists and designers exhibiting their latest creations, and the Fringe Schools Poster Exhibition at the Museum of Childhood was a great way to inspire enthusiastic scribblers through the work of other young artists. At Grassmarket, a historic marketplace just a stone’s throw from a whole host of Fringe venues, we chanced upon a really exciting piece of interactive installation by Diana Bell, with Daniel Balanescu and Helen Edwards. 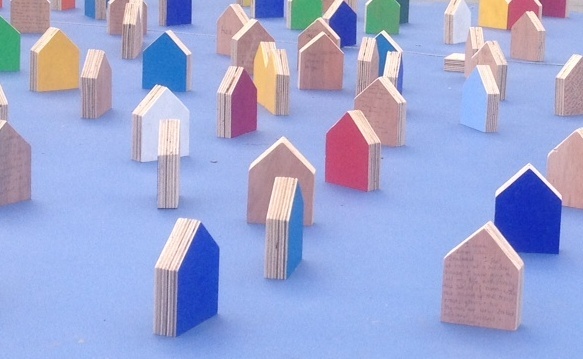 The Journey asks passers-by to share something about their life, where they come from or where they were going by picking up a small wooden house, and adding it to the installation, wherever they felt it should feature. Older children were really enjoying sharing stories of their home-towns, whilst the younger ones loved walking in and out of this imaginary village that was emerging from the pavement, moving houses around and making it their own. In addition, even the Festival stalwart The Pleasance decided to get in on the family friendly act this year by adding a ‘kidzone’ to their already popular courtyard. And all of this before you even consider that Edinburgh is a world-class city, and like any world-class city, it is home to an abundance of year-round sights and activities suitable for families. Where better to start than Edinburgh’s imposing Castle, which can be seen from pretty much anywhere in the city, and is a gift to the imagination of every young visitor. Leading down from the castle, at any time of year, it would be impossible to walk the cobbles of the Royal Mile without stopping to watch a busker, an acrobat or a magician, in the same way not a single visitor could pass the adorable and infamous Greyfriars Bobby, without stopping to rub his now gold and shiny nose! Add in Edinburgh Zoo, the Botanic Gardens and the hundreds of museums and galleries where kids can get hands on, and you should have exhausted children, happy parents and a good night sleep for all! And yes, it might be more difficult to do too much in the evening, but like us, it might be worth considering teaming up with friends and taking it in turns to continue the fun late into the night. All things considered, I would say our plans to return to the Edinburgh Fringe with the children are firmly hatched, and I look forward to hearing from anybody who might have already put my plan for next year into action. In the meantime, on the 16th August the Edinburgh Fringe Festival Society and Starcatchers, are hosting ‘Breaking Down Barriers’, a conversation to explore why early years arts are important and consider how they can make the Fringe more accessible for babies, toddlers and their adults. Sadly, I will not be in Edinburgh for this event, but I urge anyone who might be in Edinburgh at this time, with or without their children to go along, join the debate and share some of the outcomes with me. I am in contact with the Edinburgh Fringe Festival Society and hope to be able to publish the minutes from this meeting here on Arts Aloud. 1) Shame – Highly original production of spoken word, contemporary dance and hip-hop theatre exploring some of the shameful aspects and experiences of the creator’s life. 2) #MeetandTweet – Heart-warming story of Twitter’s influence on people and friendship, and a social experiment that turned into a global phenomenon. 3) Fear and Loathing in Las Vegas – If like me you found the film a little too weird and intense, then you will love this fantastic re-telling of a journey to the heart of the American Dream. The Edinburgh Fringe runs from the 1st – 25th August.